Allow me, dear readers (and especially those who are librarians), a moment of confession and contrition. Back in the early 1980s, when I was a young and not-quite-out gay man living and attending high school in the small, overwhelmingly Catholic Cajun town of New Iberia, Louisiana, I depended on the Iberia Parish Library to meet all my research needs, homework and otherwise. During my frequent library visits, I remember surreptitiously burrowing through the card catalog under the “Homosexuality” subject heading and finding a cross-reference to Mart Crowley’s landmark drama The Boys in the Band. 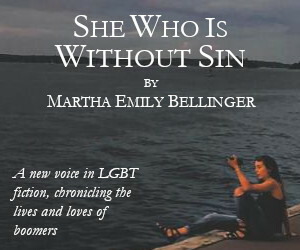 The only problem was, I couldn’t be seen checking it out because I was afraid that word would get around that I was in possession of a gay play (my dad was also minister of New Iberia’s Presbyterian church, which made my anxiety even worse). So I did what most stupid high school kids would do when trying to secure illicit, contraband material: I stole the book, took it home, and devoured it in one sitting. For me, even back in those hellish high school years, The Boys in the Band was a revelatory experience. It showed me that homosexuals are indeed real people, with real problems, real loves, and real losses. Sure, the play was dated and full of stereotypes, but somehow I knew to look beyond the stereotypes and understand that Crowley was trying to convey, through his characters, a warts-and-all snapshot of gay life. Crowley was, after all, a Southern queer (like myself) growing up in a Catholic milieu (like myself) who wanted nothing more than to be accepted for who and what he was, even if the road to acceptance was often littered with landmines (again, like myself). 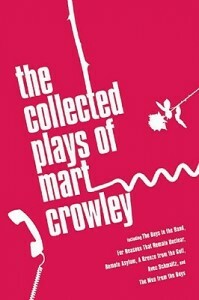 Fast forward, then, to the 2009 arrival of The Collected Plays of Mart Crowley. In the over forty years since The Boys in the Band first burst on the American theatrical landscape, Crowley has given audiences an intriguing, if sometimes maddeningly unsatisfying, array of dramatic offerings. For example, “Remote Asylum” (first presented in 1970 with William Shatner in a leading role), “A Breeze From the Gulf” (first produced in 1973), and “Avec Schmaltz” (originally performed in 1984, and starring Marsha Mason, a very young Kiefer Sutherland, and Kevin Spacey as the token gay character) are essentially variations on a common Crowley theme of troubled marriages marred by drug and/or alcohol addiction, rampant miscommunication, and internalized homophobia. 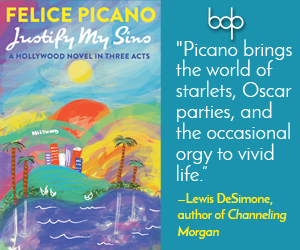 Although each of these plays have some revelatory or cathartic moments, the explicitly autobiographical “A Breeze From the Gulf” is perhaps the most heartbreaking and, thus, ultimately successful of this quasi-trilogy. Michael Schiavi, who interviewed Crowley for a profile in Emmanuel Nelson’s Contemporary Gay American Poets and Playwrights, notes that in “Breeze” Michael (Crowley’s recurring theatrical alter ego) is “tortured by his desperation to escape monstrously needy parents, his childhood molestation at the hands of an uncle, and the emerging homosexuality that makes masturbation a guilty pleasure” (96). All this baggage effectively morphs Michael into a “psychological time bomb ticking toward the ‘Boys’ explosion still eight years in the future” (96). “Breeze,” however, did not completely exorcise Crowley of his past demons. In “For Reasons That Remain Unclear” (first presented in 1993), Crowley revisits the theme of child abuse, yet this time the abuser is a Catholic priest and Patrick (who Crowley admits is a stand-in for Michael) is the latter-day abuse victim. Given the ongoing contemporary revelations about rampant sexual abuse among Catholic priests, “Reasons” is remarkable for its prescience. It is also, for me, perhaps the most effective play in Crowley’s oeuvre because, unlike Crowley’s other dramatic works, “Reasons” mitigates its agonized rage rather than allowing it to continually boil over. This isn’t to say that in “Reasons” there aren’t some well-deserved explosions of outrage, but Crowley manages to balance these explosions with moments of surprisingly overt compassion. In fact, Crowley takes this “kindler-gentler” approach to stagecraft to its logical end in his sequel to “Boys,” “The Men From the Boys” (which premiered in 2002). Crowley again brings together most of the original “Boys” characters at a “celebration of life” for Larry, who has died from pancreatic cancer, but he also introduces Scott, Jason, and Rick, three new and hot twenty-something characters to the mix. Like its theatrical predecessor, “Men” features no small amount of defiantly un-PC sniping, showboating, and shouting (unsurprisingly, age has only slightly mellowed the original “boys”), but where the characters in “Boys” bristled with self-flagellating anger at being gay in an openly hostile and homophobic world, “Men” explores how these same characters navigate (some more successfully than others) being aging homosexuals in a youth-obsessed, post-gay milieu. For many gay men “of a certain age,” “Men” will undoubtedly ring very true, though younger gays will likely be put off by the play’s surfeit of sometimes-needless drama. In fact, many readers and theatergoers alike will doubtless become impatient with Crowley’s trademark propensity for populating his plays with drastically over-dramatized “shouty” characters and situations which, at times, seem to echo any number of current-day reality TV shows. Unfortunately, while “Boys” may have cemented his reputation as America’s Great Gay playwright, The Collected Plays shows that Crowley’s lasting legacy is, sadly, not so great after all. Paper, $24.95; xvii + 460 pp.